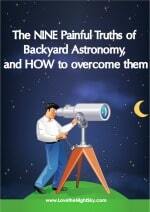 Helping Backyard Astronomers Stargaze Like the Professionals! We show you how to get more enjoyment from your backyard astronomy with easy to follow, actionable articles and guides. From techniques to challenges, telescope purchase to set-up and The Moon to Mars... our goal is to help you Love the Night Sky! Our subscribers receive a detailed weekly guide to the moon and planets, as well as exclusive astronomy content that doesn't appear on the website. Press the button below to sign up - don't miss another week!